Life at Work: Q20: Who's running your conversations? Q20: Who's running your conversations? I've just returned from Dhanakosa, a beautiful retreat centre in wonderfully sunny Scotland. We were leading a retreat with the theme, 'Who's Living your Life?' It made me wonder about communication: 'Who's speaking?' Who chooses to say what, and when? Who's in charge? Do you ever feel impelled to argue, appease, judge, persuade or please? Are these the voices inside you that shape your conversations? With so much interference on the line - so many pressures from within and without - how can we put across what we (really) want to say, in ways that others are able to hear? Let's begin with our choices. Conversations are made up of choices, moment by moment decisions - each of which affects what happens next. For example, what choice would you make here? YOU: I'm so sorry I can't manage that. I'm just too busy today. OTHER: What's so special about you? We're all busy here! Do you speak up, empathise or something else (walk away, perhaps)? And to what extent would that be your conscious choice? "I was forced to walk out - he was so rude to me." "She gave me no choice but to shout back." When we say (or imply) that we have 'no choice', it usually means we're doing what comes to mind in the moment. Probably, we don't know what else we can do. Either other options feel beyond us (like de-escalating an angry person, or replying calmly if we are furious); or every choice looks bad. A traditional highwayman offers clear alternatives - 'Your money or your life!' - they just aren't options we care for. The more choices we acknowledge, the more options we have in sticky moments; and the more we're able to stay in charge of our conversations. There are, of course, thousands of ways to create connection - but we can boil them down to just three: we speak, listen - or neither! These choices help us stay grounded and confident in a conversation, because they provide a method for deciding between the different voices inside ourselves, and the different voices in the room. Expressing ourselves ('on my ground'): We speak from and for ourselves; we express what matters to us. We place our attention on our own ground. Here, we have the opportunity to be fully heard and understood, and to engage other people's interest, trust and willingness in what we propose. Problems happen when we overemphasise our own concerns by riding roughshod over other people's; or when we understate and undervalue our own, leaving ourselves nowhere to stand. In either case, however loudly we protest, we no longer have an effective voice. Receiving others ('on their ground'): We engage with others on their ground. We place our attention on them, on what they say or do from their perspective. Here, we give other people the chance to be heard and understood without judgement. Although they're speaking, we are still an active player in the conversation. We never 'lose control' by listening. The danger lies in thinking we're receiving when we're doing something subtly different; or doing several things at once (such as listening and working out what we'll say next!). This is when we lose our way, and our choice becomes ineffective. Focusing within ('on either ground'): We turn our attention within. We muse on our issues, or we imaginatively enter into someone else's. This happens away from the interaction itself. Here, we pause to recover our sense of control. We take a deep breath or count to ten; we doodle, drink tea, take time out, phone a friend... Sometimes we head off for months or years until, older and wiser, we can discuss (or think about) what happened calmly. People focus within at different rates and in different ways; fast or slow. Difficulties arise when we give ourselves too little time, or too much. Too little time, and we can't process the situation. We feel rushed and blurt out things we don't mean. Too much time, and the issues get covered over by other things. Unresolved for whatever reason, problems which lurk beneath the surface often erupt later on. 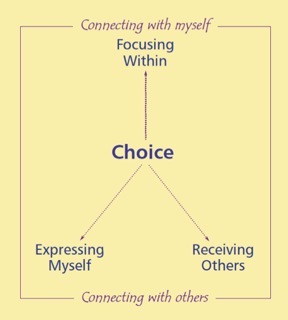 Of the three choices, the way we focus within has the greatest influence on 'who speaks' in our conversations. It's is a blueprint for our communication. If we welcome our experience spaciously, greeting it warmly, we're likely to respond the same way with other people. But if we feel uncomfortable with what goes on inside us; if we argue with it, judge ourselves, feel frustrated or unhappy because of it, the chances are we'll be like that with others too. Which is the 'best' choice? QUEEN ELINOR: I don't know what to do! KING FERGUS: Speak to her, dear! QUEEN ELINOR: I do speak to her - she just doesn't listen! QUEEN ELINOR: I could make you see if you would just - LISTEN! MERIDA: I could make you understand, if you would just - LISTEN! Conversation is not a battle for control. Real dialogue is more like a dance. We constantly choose - we mediate - between the different voices inside us and without. Knowing the different options, we become more flexible; we learn to change track. And once we know the three choices, we're never stuck. Why? Because if one choice doesn't work, we can try another! Knowing this, there's always a way forward, where our responses come freshly-minted and alive. I love this, Elizabeth. I wish all politicians could have a copy. All families. I feel very privileged to find this on my screen....now I have just to learn to go within. Thanks, Sally. I'm really pleased the approach helps.